A 300+ year old 5 bedroom cottage set in 3.5 acres of gardens and woodland with an outdoor heated pool (open between May and September). There is also an adjoining 1 acre field for access to the river walks and for dog walking. The house overlooks the Pentewen Valley and is close to lovely beaches, woodland walks, the eden project and the Lost Gardens of Heligan. Sleeping accommodation is split into two areas, accessed by separate staircases, making it suitable for two families sharing. Bookings are FRIDAY to FRIDAY between April and October but can be flexible other times of the year. This has been our second home for 15 years and we have loved spending time here and have got to know the area well. Work commitments mean we can’t be there as often as we would like so we share our home as a holiday let. Bath towels only. Need to provide your own towels for the pool / beach. Large living room with wood burning stove and 3 large comfortable sofas. 42” TV, blu-ray player, unlimited wi-fi, large DVD library and access to Netflix, books and games. Hand soap, bin bags, dishwasher tablets, washing up liquid, washing powder and all cleaning products provided. Extremely well equipped kitchen with large range cooker, large fridge freezer, microwave, Dualit expresso machine, Tassimo coffee machine and dishwasher. Variety of books available in the living room and bedroom. The garden is 3.5 acres with a lawn area and a stretch of woodland along the riverbank. There is also a 1 acre field at the end of the property which is for the use of the guests. South facing terrace next to the house. Table and chairs to seat 12. Large Sun umbrella Gas patio heater Stunning views over the Kingswood. The house has 3.5 acres of woodland, bordering onto the White River at the bottom of the garden. The garden is steeply banked with steps leading down to the lawn and the swimming pool area. These steps are not suitable for people with mobility problems and small children should be supervised. The pool area itself is flat and fully fenced so secure for young children. There is also a separate toilet and basin in the pool area. In the lower part of the garden there is a lawned area with a pergola with seating and summer house. Outside the house there is patio area with patio heater, BBQ and table and chairs seating 12. Two well behaved dogs allowed. Please clean up after the dog and ensure they do not go on the furniture or upstairs - there may be additional cleaning costs charged. The house is over 300 years old so if you are over 6ft you will need to duck through some of the doorways. The Mevagissey road runs alongside the house however all windows face over the Pentewen valley and very little noise can be heard in the house from the road. Cleaning / Towels / Linen / Maid service: The property is cleaned on changeover days, all linen is included plus bath towels. Please bring your own towels for the pool and the beach. We just spent Christmas week at this lovely house and had a fantastic time. The house was very clean and tidy with all the things you would need for a perfect holiday. Well equipped kitchen, lovely dining room for Christmas dinner, nice cosy lounge for Christmas day present opening, and for relaxing after the children have gone to bed, good size fridge freezer in the main kitchen with another fridge and separate freezer in the utility room. Ideal for ice, and drinks to keep the main fridge free for all the necessary food stuffs over Christmas. With 6 adults and four children you definitely needed them all. We had a superb stay and had plenty of days out to look around and see the beautiful Cornish coastline plus visit a couple of great pubs. The Polgooth Inn is a great place to eat and drink and less than 5 mins drive away, sadly not walkable due to lack of pavements. There are plenty of walking areas from the house around the river and into the adjoining woods so plenty for us to enjoy and the young ones to explore. Going on bear hunts was a particular favourite. Just a couple of points worth mentioning, not over negative but things to be aware of. It is a very old house so therefore great character but for over excited 3, 5 and 6 year olds too many bits and bobs sticking out to catch their heads on should they not be totally concentrating on where they were walking, things they would not expect to be there in their own houses. Also the steepness of the staircase which is clearly mentioned, was not a major problem, but the angled step down from the twin room to get to the staircase was something that did cause me concern and something you need to be aware of if you go here with youngsters. Obviously both of these things are controllable most of the time but I thought it only fair to mention. It certainly would not put me off recommending this house, or going again, but it did cause me to look carefully at who went where and when. The main concern being children walking in the night and not paying as much attention as in the day and stepping down onto the stairs with a biggish drop. Barricades sorted that problem though. The river is amazing and the wildlife around it also but very fast flowing and with children again a need to be aware. All of that said a great house, a great attentive host, a superb stay with some magical Christmas 2018 family memories. (we did have one issue and it was dealt with in less than 2 hours) Amazing. Many Thanks. We have just had a week at this beautiful cottage. It is a real home from home. The bedrooms are so comfortable and everything you need is there. The gardens are a delight to explore and the swimming pool is really warm! My dog loved the walks along the river and exploring the field too. I would add that the steps and staircases are a challenge! The days out were delightful and we particularly enjoyed the Caerhays Castle beach where the dog was welcome too. The coastal drive is very exciting and thankfully my son is an excellent driver. The views were amazing. Thank you Steph for a relaxing holiday and for arranging for good weather too. A comfy, well equipped property. Great for entertaining. Lovely pool. Responsive personable owner. We thoroughly enjoyed our stay at this lovely, homely property. It was chosen for us to spend time with friends and family for a special celebration which worked really well. The property is very well equipped. The pool is lovely, surrounded by an abundant garden and outdoor areas for warmer days. The owner is very prompt and personable in dealing with client replies. Stunning property and fantastic heated swimming pool. Pro: The cottage was exceptional in terms of size, décor and amenities, even enough DVDs to keep everyone happy! I have never before rented a property with so many kitchen utensils…there was nothing that could be added! There was a super-size outdoor table and chairs with large canopy and heater…thankfully the weather was too good to use the later! Good size BBQ was also available. Beautiful gardens with lovely secluded summer house and seating area. The heated swimming pool was the icing on the cake and we enjoyed many fun family hours together. There was a very convenient WC at the pool side, BBQ, loungers and large table and chairs. Con: The property is located along-side a very busy road, so was not perfect with an active dog and children. Trying to reverse in or out of the parking space was also a challenge. We ended up using the alternative parking near the pool, which was a bit of a hike back to the cottage. The steps down to the garden and pool area were very steep and not suitable for anyone with walking difficulties. It would have been very useful to know the property was called ‘Sunny Corner’. Although the weather wasn't great it was lovely having a cottage with everything we needed. We all enjoyed our stay especially the pool! I have just returned from my stay at this house Everything was perfect. Lovely location it is on a main round but not overly busy. I went with my family including my grandchildren who are 2 & 1 years old. Whilst the steps are steep down to the pool they both managed with the oldest one liking to choose a different path each time. The pool area is really good and was very warm. The house has everything that you need with lots of character. 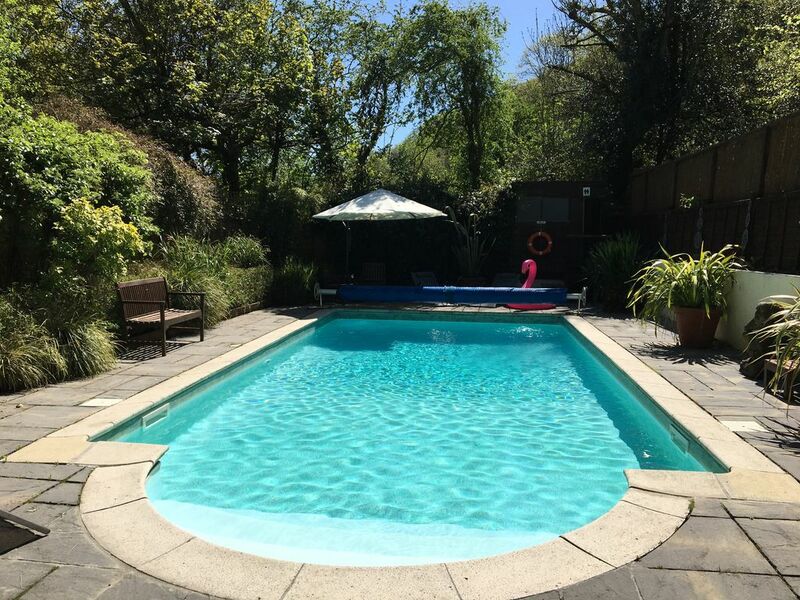 The house has stunning views across the Kings Wood which is a designated County Wildlife Site, highly regarded for its rich ground flora and fantastic scenic views across the stunning south coast of Cornwall. The local beach is Pentewen beach or for a dog friendly beach Caerhays/ Porthluney is a short drive away. The north coast beaches at Newquay are only a 30 minute drive - where you can find the best surfing in the UK. Newquay airport 30 mins by car. St Austell Train station, direct trains from Paddington - 10 minutes by car. Car essential to get the best from the area. Fowey 10 miles 20 mins by car, Newquay 18 miles 30 mins by car , Padstow 26 miles, 50 mins by car. The house overlooks the Pentewan trail which is a lovely traffic free cycle and walking path running from St Austell to Mevagissey. The trail follows an old railway line and the St Austell River for part of the way and also includes a woodland section through King's Wood. There is also a short detour to the beautiful Lost Gardens of Heligan which boasts 200 acres of gardens including Victorian Productive Gardens, romantic Pleasure Grounds, and a lush sub-tropical Jungle. From Heligan the path descends to the finish point at the lovely harbour at Mevagissey. The trail also leads to the lovely beach and harbour at Pentewan.